- -When will I see a refrigerator in our new kitchen? - - This is a problem that still has no solution. 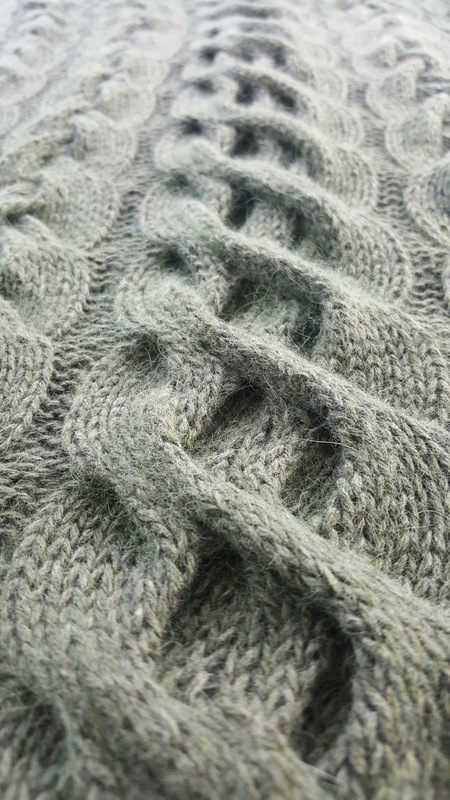 Knitting is inherently full of problems. There is always something that goes wrong even with the best patterns. 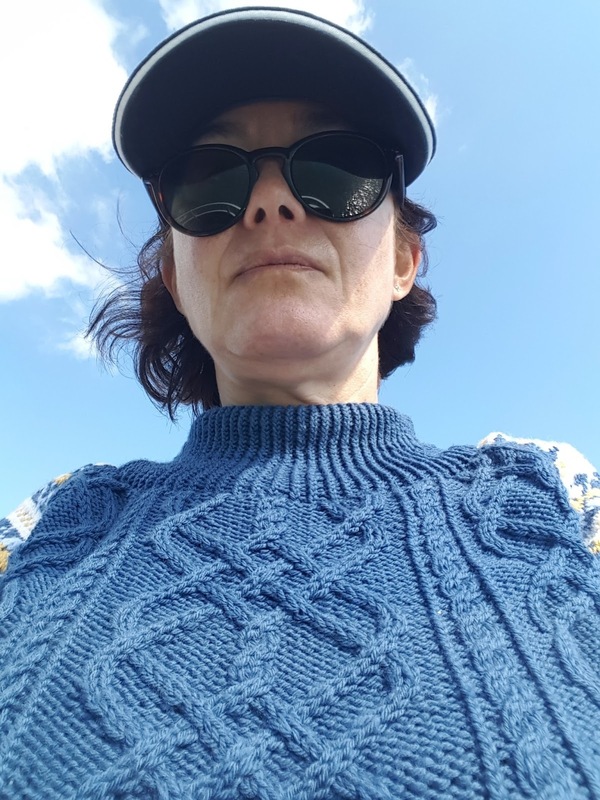 Yet, years of knitting taught me that for every problem there is a solution, and if there is not, you can always unravel your work and start all over which could be also called a solution albeit on a radical side. When the idea of the Blue improvisation sweater was born I imagined it like this. Yes, I drew a sketch, like a real pro. Because it helped to visualize better how I wanted my sweater to look: with a cabled body and multicolored sleeves. 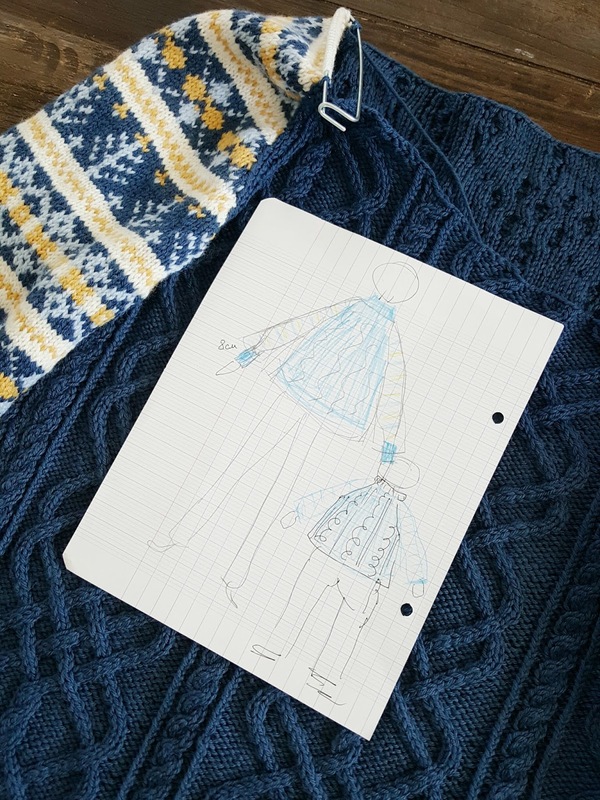 Both techniques – fair isle and aran – are old and traditional, but combined in one garment – become more modern and, dare I say, extravagant. And almost everything went well. At least till I reached the neck line. It turned out to be a real pain in the neck. 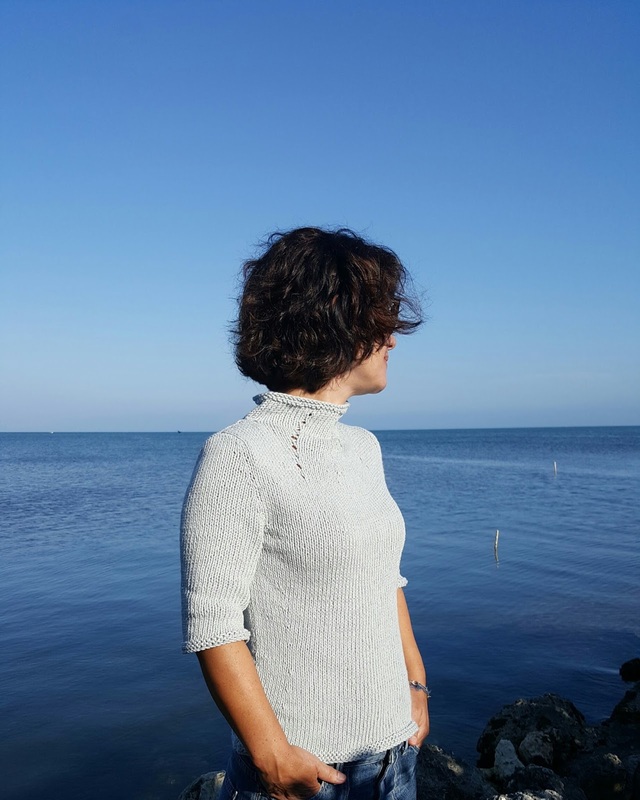 I followed the original directions for the Iron Work Sweater and its neck line was too low and too wide for my liking (keep it in mind if you decide to use this pattern!). Problem # 1. Solution - I picked up stitches around the neckline with the leftover blue yarn and smaller needles and started working in the round in 1x1 rib (all knit stitches through the back loop) while gradually decreasing the number of stitches. I put all decreases around the seams so they would look as continuation of the blue seams on the sleeves. Unfortunately I didn’t have a lot of yarn left. The last ball of Rowan Pure Wool 4Ply in Indigo in my possession was of a little bit different hue (how that could happen?!). That is why I couldn’t possibly have the turtleneck collar from my initial sketch. Problem # 2. Solution – I turned the collar, joined the last ball, and started increasing stitches mirroring the decreases (all the details are on my Ravelry page). There is a visible line at the place where a new ball was attached, yet, this line is inside the garment and no one knows about it besides me (and you). Even though the sweater doesn’t look like on my initial sketch, I like it. 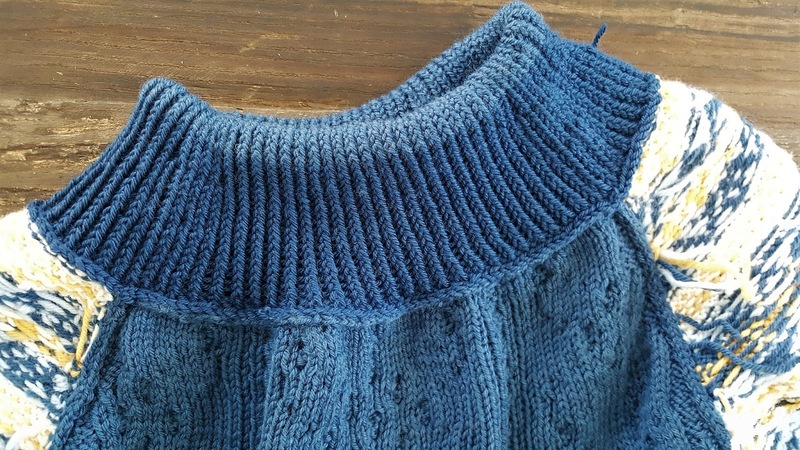 The collar is stretchy and comfortable, it is much higher than it would have been if I followed the directions for the original pattern, and it looks right for this particular project. The photographs were taken on Valentine’s day. 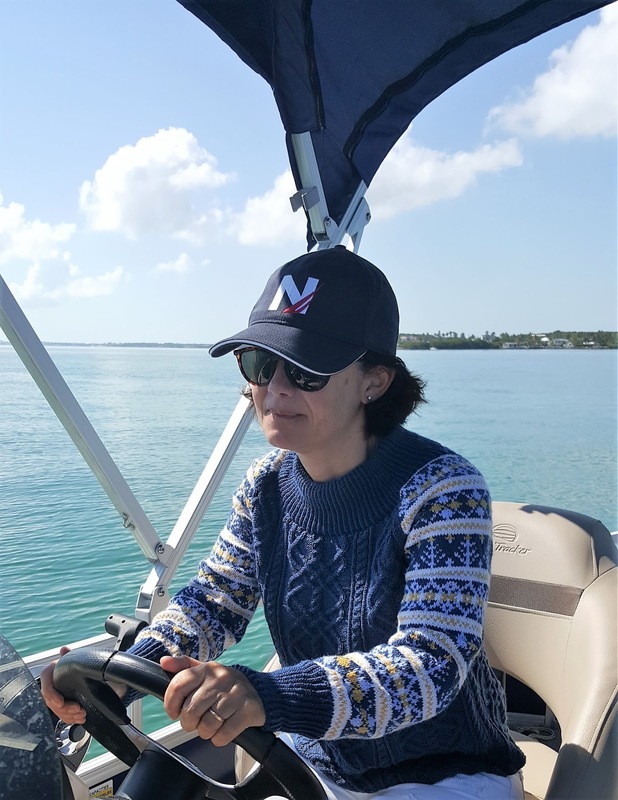 We went boating – my husband and I, just the two of us. Funny, but for many years we didn’t even think of celebrating such silly things as wedding anniversary or Valentine’s day. Now, with kids gone, we are getting more and more sentimental. Or, maybe, we appreciate more our time together, or what is left of it. Anyway, I was very pleased with this sweater. It feels soft and is weightless, fits me well and is warm enough. This whole experience – from the initial idea of a mixed techniques sweater till the final result – had a strange effect on me. It “freed” me from the directions’ constraints, so to speak, made me realize that I can do more than just follow directions. Something sort of snapped inside and released some creative potential that I never suspected to be there in the first place. Like a genie was freed from a bottle. And I started sketching, and looking for inspiration, and sketching again. That is how at the moment I got not one but two EXTREMELY challenging projects on my needles simultaneously. One – a symphony of cables, big, luscious, and almost three-dimensional. Reminds me of succulents. Two – another asymmetrical design, with a twist. Both are not finished yet, and I am not sure how they will turn out. So I’d better write about them later, when they are done. 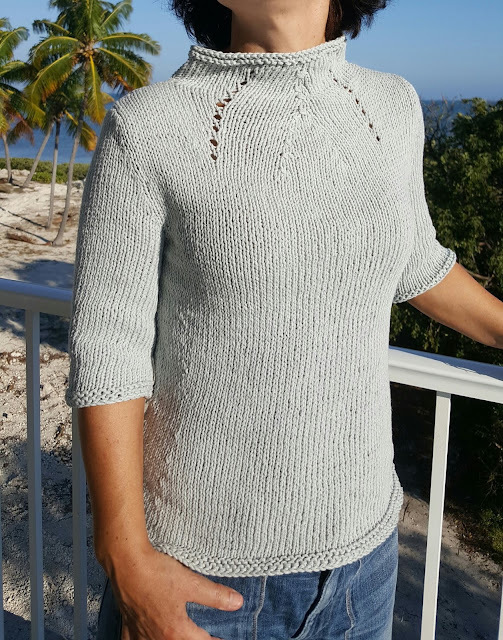 Meanwhile, I finished one little garment in between (it was my “to go” project that I could take to the knitting group with me). 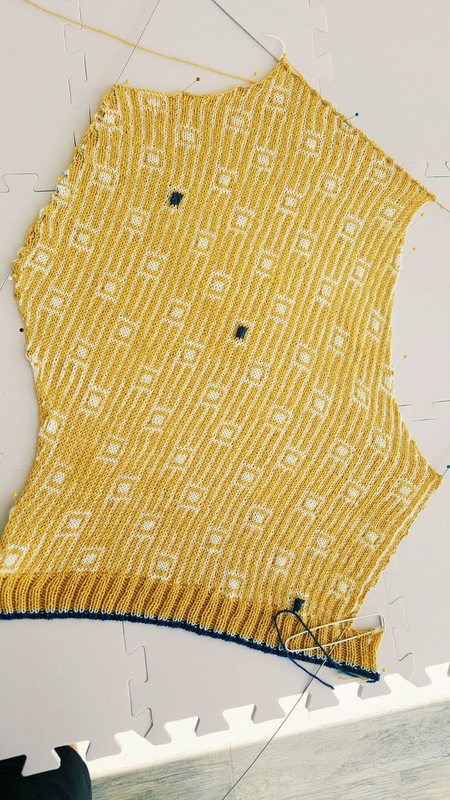 To make it I used Drops Recycled Cotton from my unraveled sweater. Why I unraveled it? I didn’t wear it, even once. 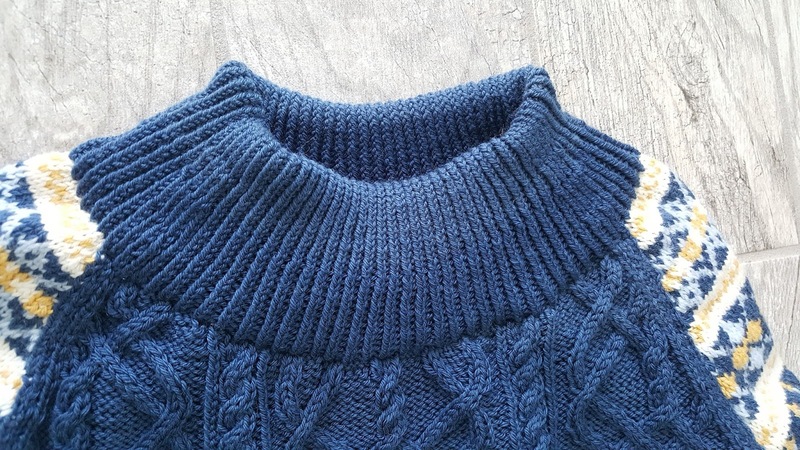 Funny, because the wool version of the same pattern I wore so much it became almost unwearable. I picked an old Adrienne Vittadini pattern that was made for a winter garment. I am a big fan of Adrienne Vittadini, I used to buy her books and yarn when she was in business. Many of her patterns are stylish, classy, and look surprisingly modern. I made a couple of them then – not everything worked well for me, but my experience with Vittadini certainly left me wanting more. This particular pattern was in my mental queue for the longest time. And I decided to try it in cotton with short sleeves – more practical for the life on a subtropical island. What can I say? This t-shirt fits me like a glove, goes with everything, and will be worn a lot. And I like it. Yet, I didn’t get as much excitement from the process of making it, or from wearing it, as I did with my experimental blue sweater. No adrenaline rush, no jitters (Am I doing it right? Do I need to unravel and start over again? ), no decisions to make. Just follow the pattern and enjoy the result. No fun at all. Meanwhile my “blue” period is officially over and I don’t have a name for the new one. Maybe “green”??? Oh, and speaking of names. Now I got so much appreciation for people who find names for things. Like Sherwin-Williams paint colors. There are many colors at Sherwin-Williams, and every one of them has a name: “After the Rain”, “Blueblood”, “Hyperblue” – these are just few examples. I would love to meet a person who came up with these names. I confess, my imagination isn’t that wild. Actually, it stops working when it comes to naming a project. “Blue improvisation” is no better than “blue disaster”. How to deal with this problem? I need to find a precise spot somewhere between pretentious and bland. Or maybe the name is not that important? After all “What’s in the name? that which we call a rose By any other name would smell as sweet”, right? Or, as a possible solution, just go to the Sherwin-Williams website and borrow a name there?